It's More Than Showing Up. All members of the assembly for Sunday Masses are called to be active participants in the liturgy. From that number there are also those called to special liturgical roles. Our parish community has many roles that are needed to help each weekend run smoothly and be joy-filled celebrations of the Eucharist. Greeters are a significant part of our weekly Sunday liturgy. They meet visitors at the doors of the church, offering this week’s bulletin with a ‘welcome.’ Most importantly, they are there to answer first questions and help people feel at home. Ushers continue the work of the Greeters, assisting people in finding a seat. In addition, they coordinate the weekly collection and assist people in coming forward for Communion. At times ushers are needed to help people find seats when there is an overflowing crowd. Refreshments are available after each Mass to allow for fellowship and community-building. Parishioners take turns providing cookies or other baked goods after Sunday Mass. There are also teams of people who make coffee and prepare the refreshments for after each Mass. Lay persons are installed as Extraordinary Ministers of the Eucharist both for assisting at Sunday Masses and for taking Communion to the sick. Anyone over the age of 16, who have received the sacrament of Confirmation, may serve as Eucharistic Ministers. Readers of the Scriptures must demonstrate both the ability to proclaim Scripture clearly and an understanding of the Scriptures they read. Anyone from fifth grade up is invited to become an altar server. Interested in joining our music ministry? Please contact Michael Puppos. 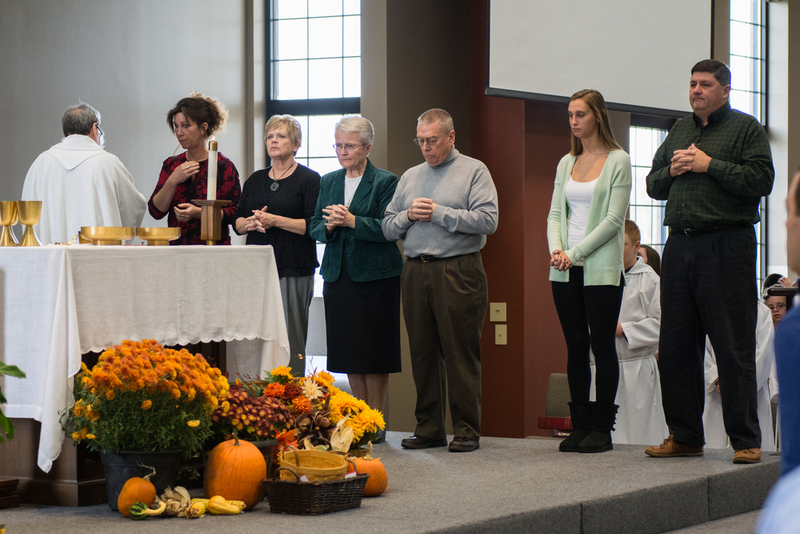 Children's Liturgy of the Word is celebrated at all parish weekend masses. This experience is for children in grades K-Grade 4. Younger children may participate when accompanied by a parent. An adult leads the children through the scriptures of the day and shares with them insights into the scripture. Materials for leading CLW are provided by the parish. We provide nursery care for little ones free of charge at the 9:45 and 11:30 a.m. Masses each weekend. Parishioners are needed in the nursery to help take care of the children so that mom and dad and have a better experience during Mass. Maintaining an environment appropriate to liturgical seasons and special feast days -- including use of flowers, banners, or other accoutrements of ambience – requires a team of parishioners who are committed to overseeing this aspect of liturgical celebrations. Pastoral Care to the sick and home-bound includes several components: assisting and providing Communion at two different nursing homes; regular visits, usually with Eucharist, to home-bound; post-hospitalization visits until people are able to return to church; and visitation to those in the hospital. Those who know someone who is home-bound but not on our list, can contact the parish office. Those who are interested in being part of the team are encouraged to contact the parish office for an interview and training. Saint John XXIII Parish has many regular outreach programs. This annual "mission trip" in our own back yard (Wood County) helps local residents in need. Saint John XXIII regularly participates in providing food for the PCU food pantry as well as assisting with blood drives and other community concerns. A team of parishioners works closely with families/individuals in need. They also provide special assistance through the annual Thanksgiving Baskets, Christmas Giving Tree and Easter Baskets. Our Knights of Columbus Council hosts four blood drives each year in the Parish Life Center for the American Red Cross.